The Vancouver Canucks have a pair of young goaltending prospects coming through the system in Thatcher Demko and Michael DiPietro that would make other teams envious. Both have the potential to contribute at the NHL level, and after adding Jake Kielly recently the team has strengthened their depth at the position. 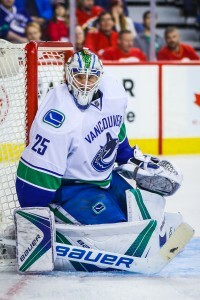 Still, the best goaltender in the organization right now is Jacob Markstrom, who posted another strong season and has established himself as a legitimate starter in the league. I have had discussions with Jacob and he calls Vancouver home. He would like to be a part of it long term. That’s where his instructions will lean, to try and get something done. What that deal would look like isn’t clear at this point, as there are plenty of things to consider from Vancouver’s perspective. First and foremost is how much an extension would cost, given Markstrom is already making $3.67MM next season. Committing to a long-term deal would essentially be handing him the reins for the Canucks’ upcoming window of contention, even though it is not yet clear if he can really be a standout at the position. Markstrom’s .912 save percentage the last two years is solid, but he’s shown a lack of consistency at times. The other thing is the upcoming expansion draft, in which you can only protect one goaltender. Markstrom and Demko will both be eligible for the draft, meaning the team may want to move on from one of them before they’re at risk of being snapped up by the Seattle franchise. That won’t be happening until 2021, but it will certainly figure into the decision making process this summer when it comes to a potential Markstrom extension. Either way, the Canucks don’t necessarily have to make that decision right away. The team is expecting to compete for a playoff spot next season and will likely give Markstrom the first crack at taking them there, but any struggles could see Demko’s time come without hesitation.